Property numbers correspond to lot numbers on Map - for a photo of a house on some properties, please click on the cameras. Hugh Queen (1783-1867) spouse, Catherine Flemming (1787-1870). Eleanor (d. Nov 1848) spouse, William Bell. Children. William Graham - Original grant in 1828 (The 1828 land map shows Simon Grahan (b. 1787 - d. 20 Jul 1834 by drowning in Reversing Falls, body never found) consolidated with land of William Graham at a later date. 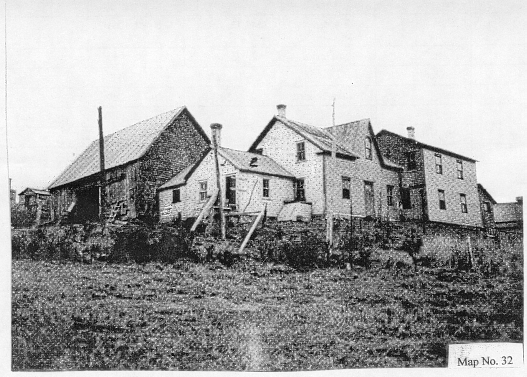 03 Property - Original grant in 1829. Note: *Dates taken from school records. Other information on the Miller family obtained from cemetery records. Lelsie Elder, son of Ernest and Margaret (Miller), lives in Saint John, NB, but did not supply family information. Scott dates are from United Church records. 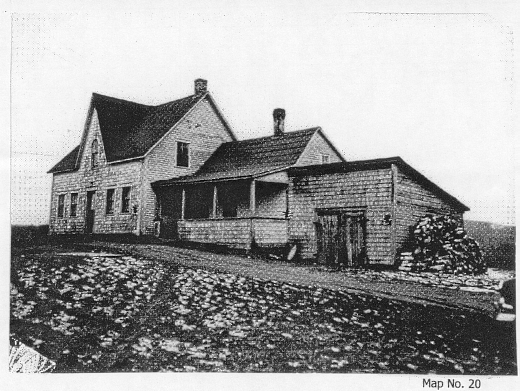 05 Property - Original grant in 1829. 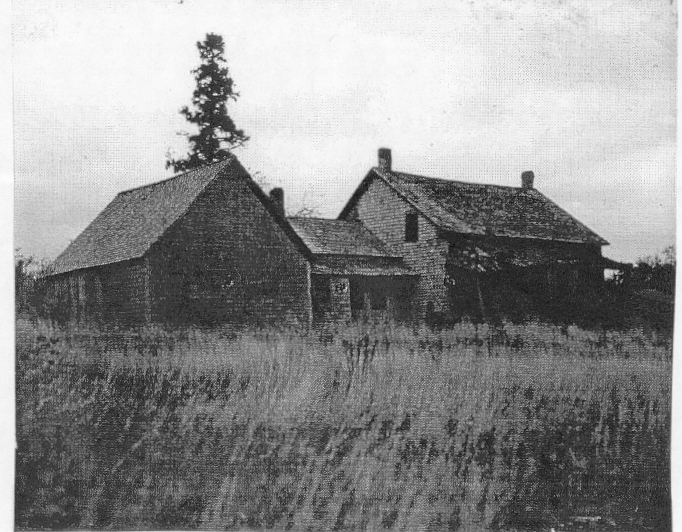 The original house built, was later replaced by a larger one nearer the road, which is the home pictured. 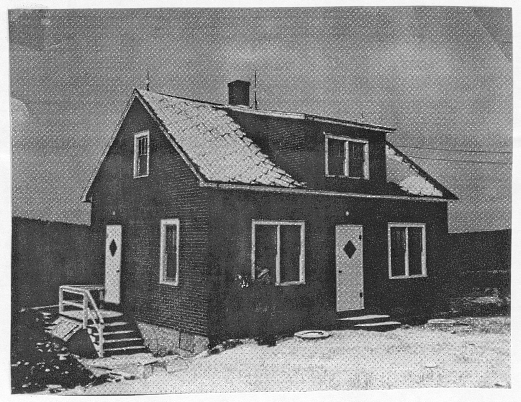 No pictures of the original home were located. Thomas J.P. Leonard (b. 1819 Ireland - d. April 23, 1897 ) spouse, Jane E. Feb 17, 1832 in NB) A school teacher in 1871 census and shop keeper in 1891. Thomas A. (b. May 31,1866 - d. March 30, 1925 ) A school teacher in 1891 census. James Mahood - Original grant issued to James Mahood in 1829, (believed to be the brother to Samuel Mahood, b. 1800 - d. 22 Mar 1873). It would appear the first James Mahood was the grandfather to James, born in 1872. No records could be located to give the family history of James who settled in 1829, and the next generation. The school records show other Mahood members, however do not list parents. Alicia Almire (b. Jan 30 , 1878 ) Married Herbert Ferris. Oliva , (b. 1815 ) in Ireland, sister to George. James Samuel Mahood spouse 2) Elsie Schuler (1877 - 8 Jan 1929) She had m.1) Harry Puddington . 07a Property - Building lot on Mahood Property - from the well on this property, the drinking water for the school in later years, was secured by pail. 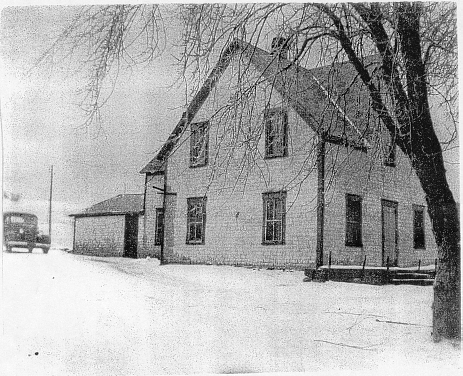 08 Property - unoccupied, except for a barn set off the road back of the United Church horse shed, seen in the picture of Christopher Barnett's home. 09 Property - a small cemetery was located on the property, for the Cooper family, by the highway. James Edward Maxwell ( b. Jan 15, 1866 ) spouse Elizabeth Howe (b. Oct 9, 1863 ) married Oct 8, 1889. Margaret Alma ( b June 18, 1887 , married 1 ) John Corbett on Sept 21, 1910 , 2) Leonard Miller on July 15, 1940. Thomas Graham - Original grant in 1829. 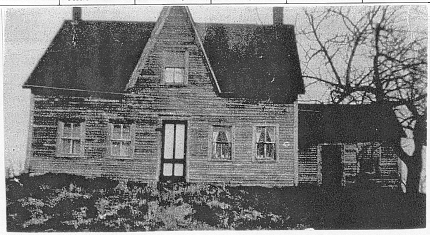 When Frank Woods became to owner, the land was vacant, and remained vacant, to be purchased by Austin Graham for the lumber on the property. 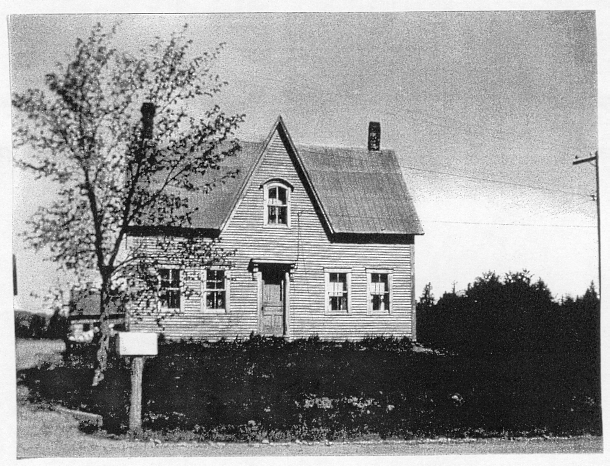 15 Property - Original house destroyed by fire in 1947. 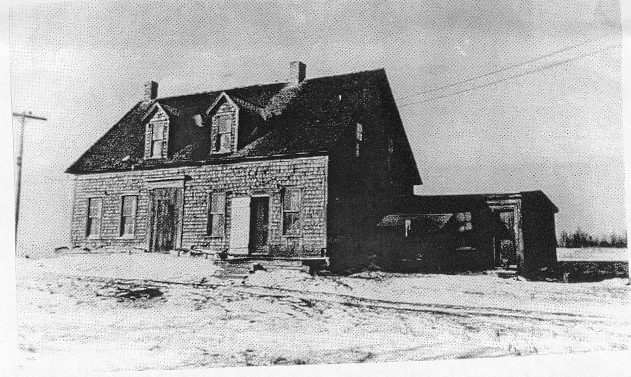 Sketch that follows shows the original home and buildings. Jane ( b. July 1899) married April 24, 1920 to Charles McCullum. Was Helena Known as Pearl ? or were they twins ? Albert McCutcheon (4 Nov 1882 - 5 Nov 1960) and spouse, Jane Eliza Pettie (31 Jan 1888 - 4 Feb 1941) who were married 23 Dec 1905. Arthur Graham - (3 Nov 1859 - 5 Dec 1942. He was the son of Richard Graham (b. 1819 in Co. Tyrone, Ireland, d. 1899, and Margaret Jane South.) spouse Elizabeth Greer (May 2, 1860 - 16 Jan 1946) the headstone in the Woods Cemetery shows her birth date as 1860. Lot on west side of property, vacant at time of expropriation. Harold (b. 1920 - d. 1994 in England. Served in WW2. William McCutchean ( b. 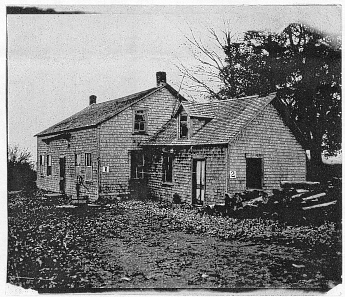 1868 ) lived with the Bell's. 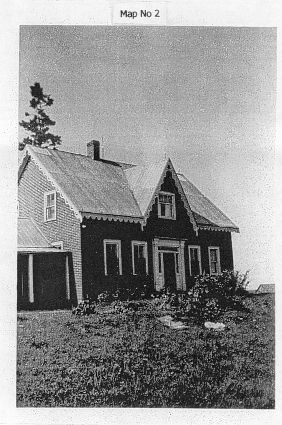 In 1941 the house was demolished, leaving the barn, which was used until 1953 for storing hay and straw. The property was across the highway from Harry Woods" property - Map 19. 23 Property - Property burnt, buildings not rebuilt. remained vacant land until 1953. William McKee ( b. April 6, 1845 ) - spouse, Annie Morrison died between 1899 and 1901. Jean ( b. Oct 6, 1883 - d. July 1, 1908 ) married Robert Guild. Phoebe White (b. May 20, 1886 - 23 Feb 1957) unmarried. She was the Sub-Deputy Registrar of Births and Deaths in the area. Joseph Phillips ( b. 1909 ) brother to Ada Phillips (see Map 26). He was born in England and raised by the White Sisters. Served in WW2. Richard Hewlett - Original grant 1833 ( b. Aug 15, 1797 - d. 1881 ) married March 21, 1844 Margaret Paddock ( b. July 1, 1813 ) Their daughter Margaret married Dr. Tisdale Gilbert Humphrey , they are buried in the Saint John's Cemetery, Gagetown. Frederick Whipple (28 Oct 1898 - 28 Feb 1964) 2nd. spouse, Muriel Byers (b. 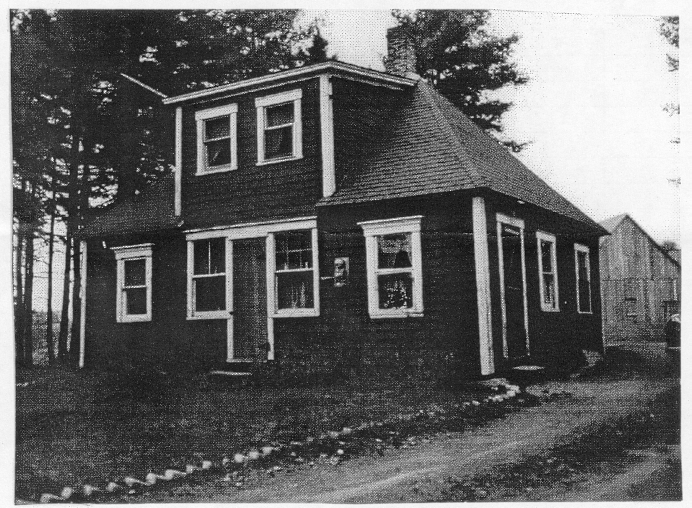 23 Apr 1898 - d. June 8, 2008 ) Muriel had three children from a first marriage to Wesley A. Driscoll on Nov 11, 1933 and lived in Coote Hill. Coster (1 Aug 1949 - 29 Jul 1984) spouse, Sharon Whiple ? Christopher Barnett (14 Dec 1891 - 12 Dec 1948) married Oct 9, 1919 Mary Pettie (30 Apr 1892 - d. in ON) Christopher rented this property, and after it burnt on 11 Nov 1932, the family moved to a lot on the Mahood property, see 7A. Thomas C. (b. Oct, 1860 - d. 17 Sep 1930) never married.